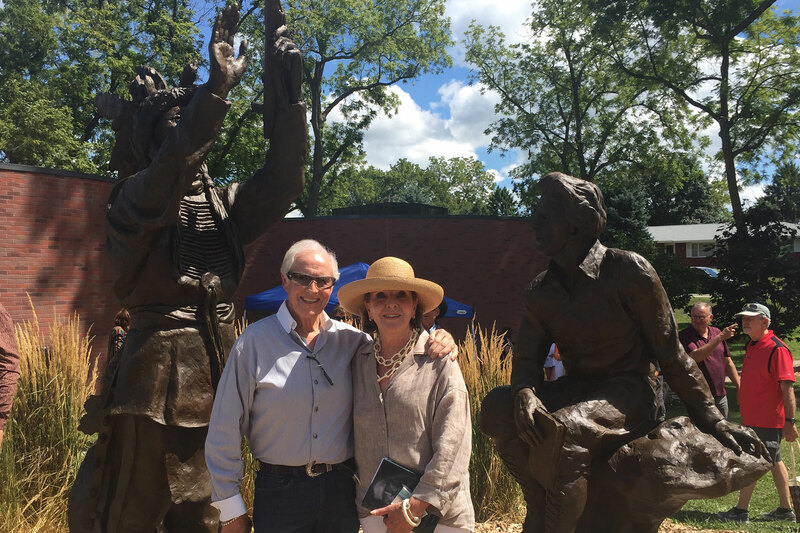 Herb Mignery and his wife Sherry proudly presented Herb's sculptures to the Neihardt State Historic Site on Sunday, Aug. 7. WSC alum Herb Mignery's sculptures of John Neihardt and Black Elk were added to the Neihardt State Historic Site in Bancroft, Neb., on Neihardt Day. Two sculptures created by Herb Mignery were dedicated at the John G. Neihardt State Historic Site in Bancroft, Neb., during the 51st annual Neihardt Day celebration on Sunday, Aug. 7. Mignery attended Wayne State from 1955 to 1959. The two bronze sculptures depict WSC alum John G. Neihardt, Poet Laureate in Perpetuity of Nebraska, and Nicholas Black Elk, the Oglala Lakota holy man whose story was told in Neihardt’s book, “Black Elk Speaks." The sculptures depict Neihardt taking notes from conversations with Black Elk on the Pine Ridge Indian Reservation in 1931. "Black Elk Speaks" tells of Black Elk's life experiences during the American Indian Wars of the late 19th century, from the Battle of the Little Big Horn to the Wounded Knee Massacre. Mignery has been named an Outstanding Alum for 2016 and will receive the award at this year's Outstanding Alumni banquet during Homecoming. He resides in Loveland, Colo., where he operates his art studio.